MESA – With kicks, blocks and twists of the wrist, 16-year-old Kylie Hunts-in-Winter is teaching Native American boys and girls to stay safe. Her defense classes have a mission: to keep more indigenous women and girls from disappearing and dying. An estimated 500 have been lost to violence over the past decades, but experts said the number is under-reported. 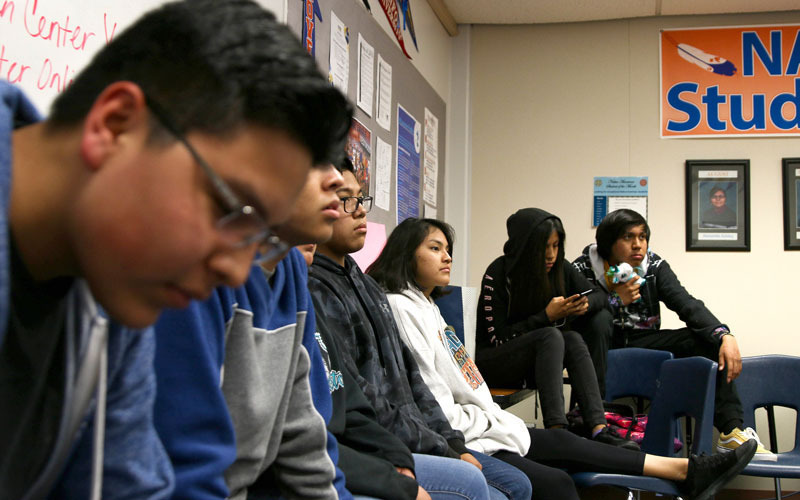 “Native women are more likely to be a target of attacks and will need to defend themselves more,” Hunts-in-Winter said as she taught members of the Native American Club at Westwood High School. Hunts-in-Winter, a member of the Standing Rock Sioux Nation, said she teaches people so they can teach others. Souta Calling Last, executive director of an educational nonprofit Indigenous Vision , said the class is one more way to educate others about violence inflicted on Native women. The awareness movement is known as #MMIWG , for missing and murdered indigenous women and girls. A study that began in 2017, by the Urban Indian Health Institute identified 506 cases of missing and murdered American Indian and Alaska Native American women and girls in 71 cities across the country. It also states that the number of cases is likely an undercount due to the limited resources and poor data collection. “It could be me,” Calling Last said. “An unprecedented amount of women from my community are disappearing at alarming rates and it’s an epidemic in Canada and the U.S. The epidemic hits as close as worrying about my own sisters and myself. Hunts-in-Winter has a black belt in Kenpo karate and holds belts in other martial arts. She highlights videos of other women in martial arts on her Instagram page, which has nearly 40,000 followers, some of whom tell her their personal stories of survival. A major part of self-defense is verbal. Hunts-in-Winter will teach classes next month on her reservation and this summer at a camp in Montana for Native American girls in foster care.